I'm going to start off by saying I had a hard time getting into this novel. Honestly, I think it had to do with pre-conceived notions due to pop culture sparkly vampire overload when I heard "vampires" and "romance," but let me tell you, this novel blows everything you think you know about vampires and romance right out of the water. The story is a beautiful, well-written and amazingly constructed series of twists and turns, questions, discoveries, and overlapping mysteries that will consistently keep you up past your bedtime to read "just one more chapter." 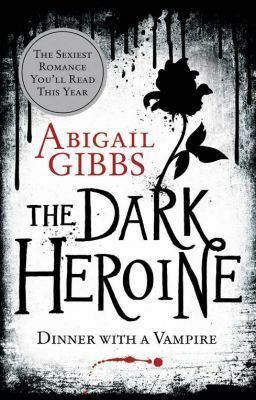 Again, as I said, I had those pre-conceived notions, but this novel was absolutely refreshing in the fact that it hit the nail on the head as to how I personally view vampires - realistically. She develops them as a sophisticated people; timeless, luxurious, with rich histories. They're also blood-thirsty killers, but what can you do other than succumb? Gibbs' characters, and I mean ALL the characters, not just the main ones are real. They have personalities that mesh, or clash. They're not just there to drive the story or for filler. They are all an integral part of the bigger picture. Violet, our leading lady, is mature and level-headed, but seriously stubborn. She's a perfect contrast to snarky bad-boy vampire, Kaspar. Despite the fact that this is the "sexiest romance you'll read this year," it's realistic. Can I stress that enough? I am not a romance fan in most cases and I loathe insta-love in books. So, I absolutely love that this is a well-developed, not forced, romance/love-triangle. Now, let me really blow your mind. I rarely talk about an author personally in my reviews, but this bears mentioning. The author is a teenager. You read that correctly. She wrote this (albeit not the final version) at 15 years old. I'm not telling you that this is the reason you need to pick up this book right now, but to have such an artistic ability with words at such a young age is a true talent and everyone should keep their eyes open for more of her work. Autumn Rose (The Dark Heroine, #2) is expected on August 29th!